It’s that time of year again! 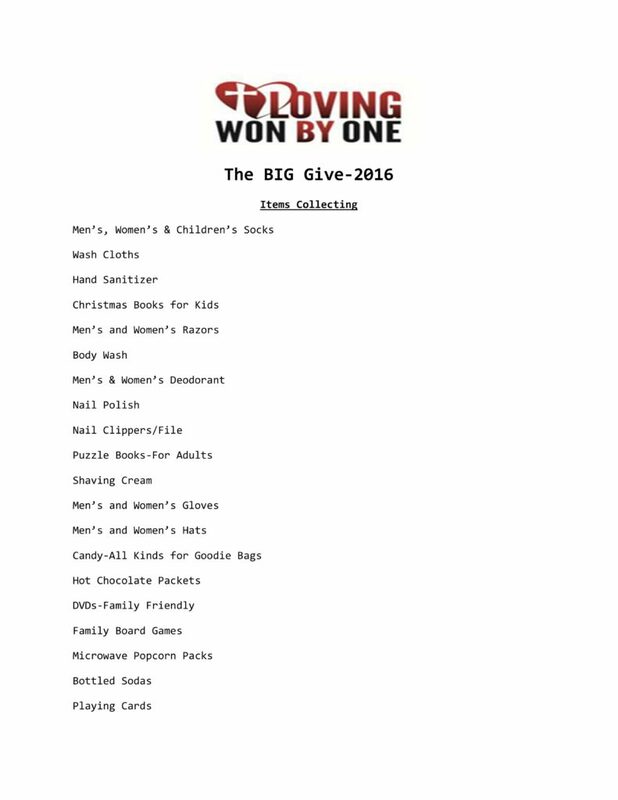 We are getting ready to share the love of Christ and the reason we celebrate Christmas to the less fortunate of Atlanta with this year’s BIG Give. We are excited to announce that this year we will be partnering with two local ministries, GA Calls and About My Daddy’s Business. Both of these awesome organizations share the same mission we do in caring, loving and walking with the men, women and children that need to hear and see the love of Jesus just like we do. We are going to be serving quite a few families with GA Calls and providing them with a “Family Night Fun” basket and treats and then will also be heading to the streets of Atlanta in some high trafficking areas and then into the Bluff to provide a meal, goodie bags filled with fun stuff and necessities for the men, women and children in these areas. Below is a list of items that we are going to be collecting for both events. If you could please reach out to your neighbors, families, friends, etc and see if there’s anyone that can assist us in making this happen again this year, we would greatly appreciate it!! I can arrange to come pick up anything or meet you if you have some things to donate. Also, if anyone’s interested in just donating directly, here’s the direct link: https://www.razoo.com/us/story/Loving-Won-By-One. Thank you so much and please know that we are always appreciative for your help!